Winning is habit-forming for Hailey Harward and Lilly Nelson. Barely 48 hours after helping Aspire's 14N Black win the American Division of USA's Junior Nationals in Columbus, Ohio, they travelled across the country to take on the best 14U beach players. After fighting back from an ominous 10-23 deficit in the finals, they took the match 28-26 to be crowned champions! Amazing ladies. We are proud! Aspire players - Victoria Flys (18 Black), Rachel Fagerburg (16 Black) and Katie Porter (16 Black) and Head Coach Carlos Flys (15 Silver and 18 Black) helped the Arizona Special Olympics Unified Volleyball team claim a bronze medal in Division II (Special Olympics) of the U.S. Nationals Open tournament in Salt Lake City over Memorial Day weekend. The team is sponsored by Aspire Volleyball club and makes Aspire it's training home. 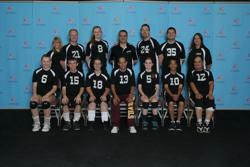 Coach Carlos was also named Head Coach of the National Special Olympics Unified Volleyball All-Star team. The team of Brooke and Lauren (Aspire 12N Black) went an incredible and undefeated 26-0 to capture the Court One Sundays at the Beach Championship. Amazing job ladies! Aspire Spring Break 12s 4-on-4 Champions! Anna, Nura, Brooke and Lauren from Aspire 12N Black win the Court One Spring Break 4s tournament (12s Division). Amazing job ladies! Hailey Harward and Olivia Hallaran of Aspire 14N Black make the USA Red Team at the Olympic Training Center and represent Aspire and the State of Arizona with pride AND BEASTLY SKILL! We are proud of both of you! For the 2nd year in a row, Aspire's 12 Black team has gone through the AZ Region season undefeated and won the Region Championship. This year they did not drop a set in the tournament. Great job ladies, way to dominate! 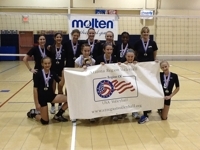 Congratulations also to the Aspire 12 Silver team for winning the Silver division at Regionals. That is the top finish for any club "2's team" in the Region. Aspire players dominate the younger age divisions of this weekend's USAV Jr. Beach tournament winning Gold in the 14U and 12U categories. Hailey Harward and Lilly Nelson of Aspire's 14N Black team went undefeated in the 14U age division and won the event for the third year in a row. Brooke and Lauren of Aspire 12N Black took gold in the 12U age division. Both teams qualify for the USAV Jr. Nationals this summer. All four players already qualified for the USAV Jr. Nationals in indoor volleyball with their respective Aspire teams. You guys are awesome. Congrats! Brooke and Lauren of Aspire's 12N Black team win the 12U age Division of the USAV Jr. Beach tournament and qualify for nationals. Congrats! Congratulations to Aspire 14N Silver players Vanessa Trujillo, Allison Obarski, Taylor Sifferman and Desiree Rodriguez who went undefeated this weekend at the Barca Beach 4-on-4 tournament and took first place! Way to go ladies! Another National Qualifier and another bid to Junior Olympics for Aspire. This time the 16N Black team traveled to Minneapolis and played strong volleyball losing only one match before avenging that loss in the finals and bring home the championship and the American bid. Aspire's 17N Black also made it to the Gold Bracket in the National Division and took 9th place and the 18N Black team made it to the Gold Bracket of the American Division before losing to the eventual champion of the tournament. Great job players and coaches! Congratulations to Aspire's 12N Black for going undefeated in Anaheim and winning the Southern California National Qualifier and with it a National bid to the Junior Olympics this Summer! Aspire's 15N Black goes undefeated and earns a National Bid to the Junior Olympics by winning the Arizona National Qualifier. Aspire's 15N Silver takes 5th at the qualifier. Great job ladies and coaches! Aspire's 13N Black goes undefeated and wins the Arizona National Qualifier to earn a National Bid to the Junior Olympics this summer. Aspire's 14N Black takes 3rd in their age division having previously won a bid at the Colorado Crossroads National Qualifier. Way to go players and coaches! Aspire 14 Black swept through a weekend at Colorado Crossroads American Division National Qualifier without dropping a game and won the Gold Medal - and with it, a bid to the Junior National Olympics in Columbus, Ohio this Summer. Congratulations to player and coaches for a dominating performance! Congratulations to Aspire teams who went to Colorado Crossroads National Qualifier this weekend and had impressive performances. In addition to the 14 Black Championship and Junior Olympic Bid, Aspire's 13 Black took 3rd Place overall in the 13 National Division, Aspire's 13 Silver team ended up in the Gold Bracket of the 13 American Division, Aspire's 15 Silver team went 5-3 and had a solid showing in the Flight 1A of the American Division and Aspire's 16 Silver team had a great showing ending up in the Bronze Bracket of the American Division. All 5 teams went undefeated on Day #1 of the National Qualifier. 15-0 start for the tournament set the tone for an incredible weekend for Aspire on a national level. Congratulations to our awesome athletes and coaches! Congratulations to the players on team Aspire-Ashton for winning the 4th - 6th Grade YMCA Summer League championship for the East Valley Region. Our Junior National Champions Aspire 14N Black were interviewed live on 12 News on Tuesday morning, July 31st by Reporter Syleste Rodriguez. Aspire was part of 12 News' Future Olympians series. Way to go girls, we are so proud! Aspire's Lilly Nelson, Logan Wallerstedt, Preslie Anderson and Alysson Eylers helped lead their AZ Region High Performance team to a gold bracket birth and a 5th place finish in an 18 team tournament that featured High Performance teams from other regions and the USA Select A2 Team. Great job ladies!